The Schuylkill Highland's and Hopewell Big Wood's region of Chester, Berks, Montgomery, and Lancaster counties can boast the longest history with the iron and steel industry in our nation. This region of America literally 'forged the nation', encompassing 300 years of industrial sites that reflect the contrast between the technological advances and rural way of life and landscapes of the region. In the early 18th century, immigrant colonists came to the area seeking a better life. Using the area's natural resources, they stayed to build a nation during the American Revolution. Joined by new generations of immigrants in the 19th century, their descendants fought to preserve the nation during the Civil War, then led the nation into massive industrialization, and on to be a 20th century world leader and power. The region saw the struggle to end slavery as well as welcomed our nation's first female industrialist. 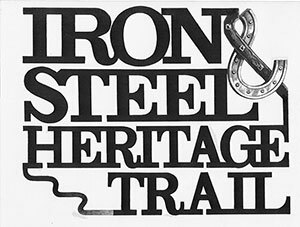 In 2016, the Iron and Steel Heritage Partnership celebrated 300 years of Pennsylvania's Iron and Steel Industry. The Partnership's mission is to foster a better understanding of the Schuylkill Highland's contribution to iron and steel making in America, while Hopewell Big Woods remains one of America's finest natural areas. The Partnership is implementing a marketing plan to connect visitors and residents to the outdoors and increase awareness, appreciation and use of the scenic, cultural, historic, recreational and natural areas in the Middle Schuylkill Region of Chester, Berks, and Montgomery counties. Visit the Iron and Steel Heritage website. View a brochure for the Iron and Steel Trail.